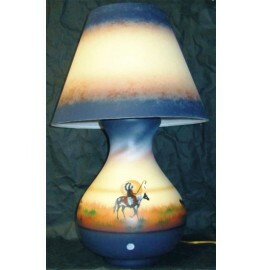 A genuine Native American hand painted table lamp with the image of a Proud Indian Chief mounted on a Paint Horse riding in the sun across the desert. The lampshade has a misty blue band hand painted around the upper and lower edges that matches the top and base of the Navajo pottery lamp. Available in your choice of seven (7) different style pottery bases. Comes with hand painted shade as shown in proper size to fit the base.